I am currently in Washington DC rehearsing Salome with a wonderful cast. In addition to Deborah Voigt we have Daniel Sumegi, who last appeared at Glimmerglass in The Barber of Seville as Don Basilio in 2006. Here he plays John the Baptist (Jokanaan), who loses his head. Other cast members include the Wagnerian tenor Richard Berkeley-Steele and Doris Soffel, making her debut here as Herodias. This new production at Washington National Opera is designed by Peter Davison (sets), Anita Yavich (costumes) and Mark McCullough (lighting), who returns to Glimmerglass this summer for his ninth season. We open October 7, and the production runs through October 23. I recently left Minneapolis, where I was working on the new play, A Master Butchers Singing Club, which was adapted for the stage by Marsha Norman from Louise Erdich’s novel. Here is a nice article with Marsha Norman and Louise Erdich: The power trio behind ‘The Master Butchers’. 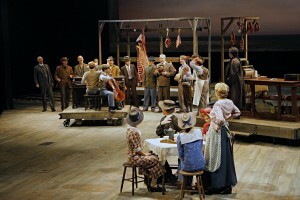 The Master Butchers Singing Club runs through November 6. The fall continues to be busy. On November 10 at 7 p.m., I am speaking at OPERA America as part of its Making Connections series. Make your reservations through OPERA America to join us for the discussion or check the OPERA America homepage, where the lecture should be streamed live. I will also speak at the Wagner Society of New York on November 17 at 7:30 p.m. about Valhalla East and West, San Francisco Opera’s Ring Cycle, and plans for the Glimmerglass Festival. Friends of Glimmerglass at these events should be sure to say hello.